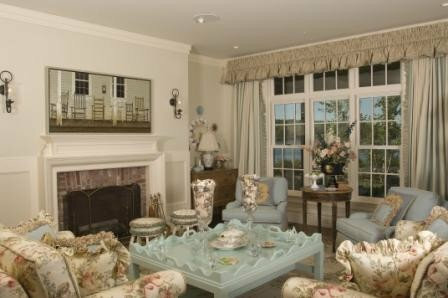 The living room captures the cottagey feel which our client requested - comfort. A custom sized coffee table painted in pale blue. the drapery are cream and pale blue stripes. 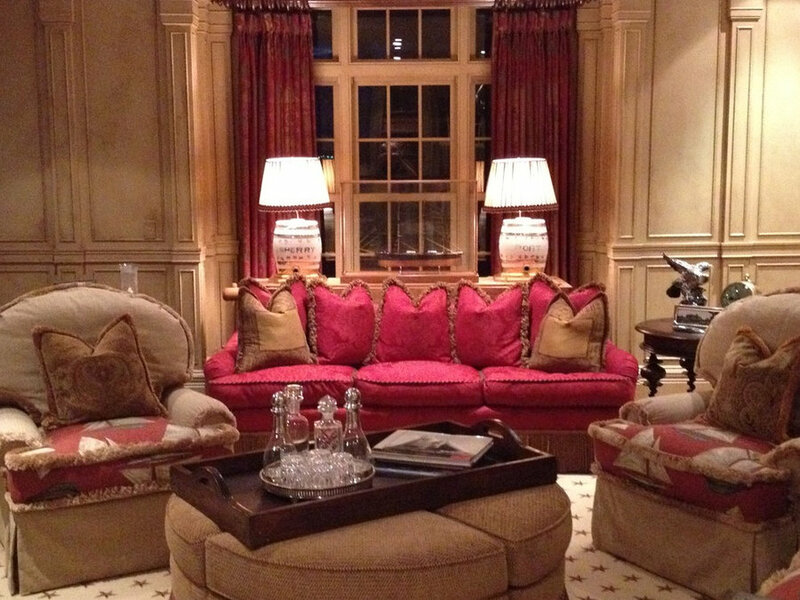 We created the ruffled valance to create softness in the room. 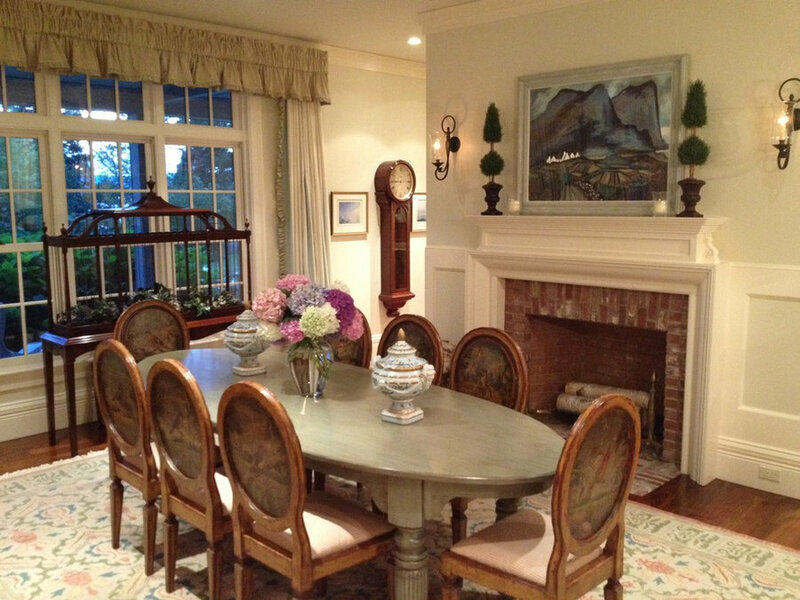 Between the pair of blue upholstered chairs is a vintage painted table with handpainted scroll work. 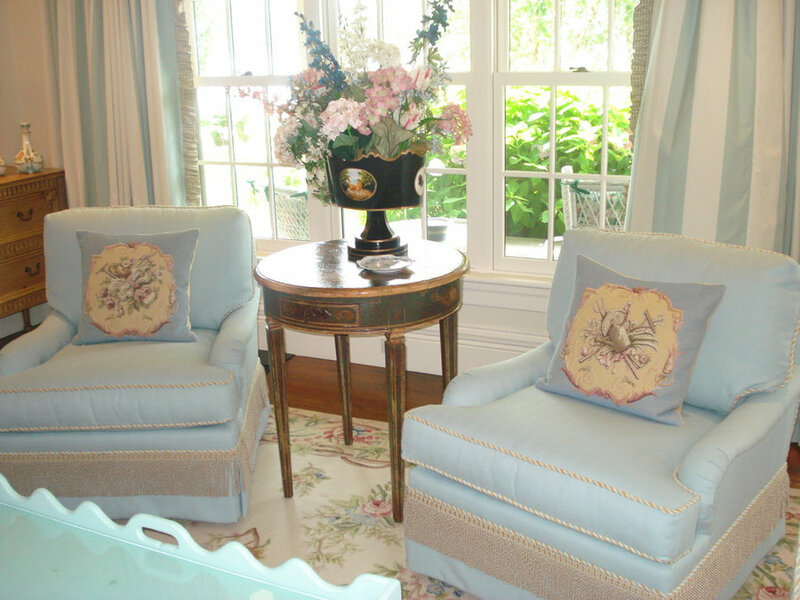 Between the pair of blue upholstered chairs is a vintage painted table with handpainted scroll work. We love making our own flower arrangements and we did this in the metal cachepo we found. Enjoy! 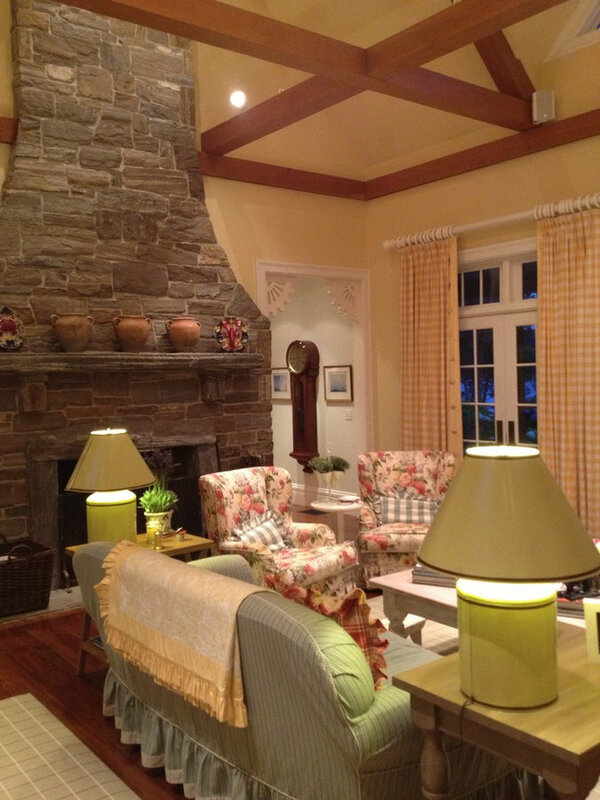 The living room captures the cottagey feel which our client requested - comfort. The rug is custom made using the colors from the floral designed sofas. A custom sized coffee table painted in pale blue. The end tables are handpainted custom designed vintage table which we found. 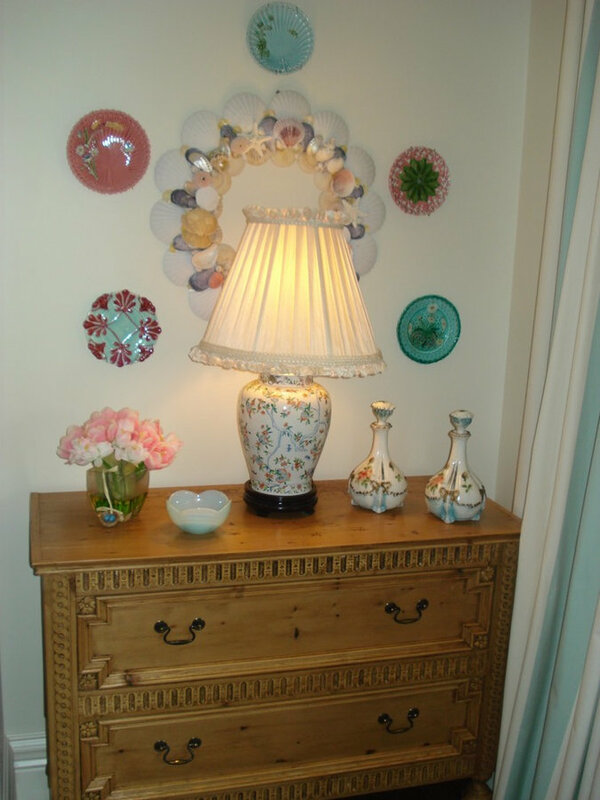 We placed a pair of antique floral lamps sit on these antique pine chests. We hung majelica plates and a shell wreath above . Enjoy! 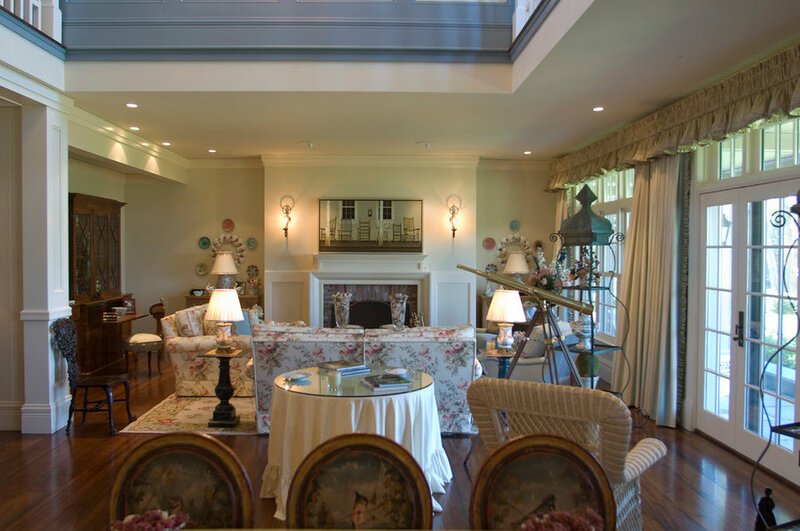 the living room and dining room are open to one another with a cocktail area in the center by the skirted table. 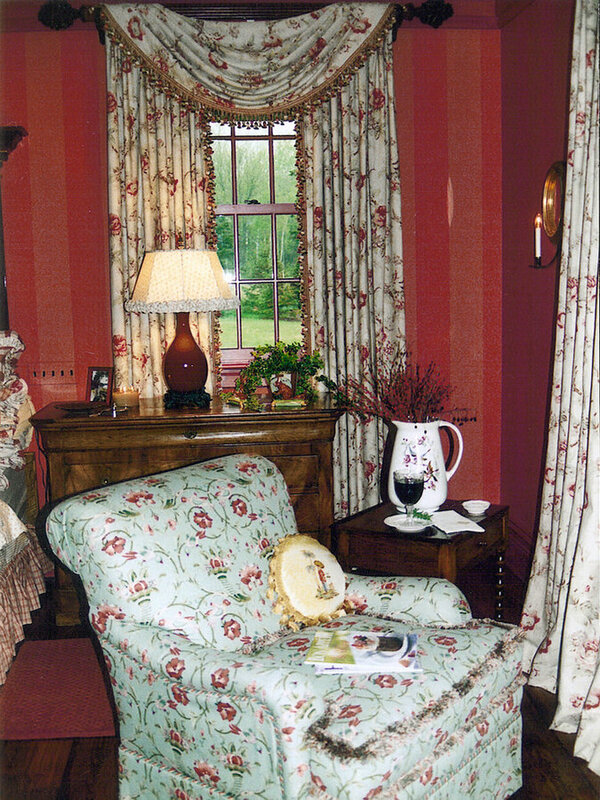 We chose to use a mix of antiques, with painted furniture, and floral print sofas. Between the dining and living room we created this cottage look by the center hall table which is skirted in a pale cream and taupe fabric. The pair of etegare's flanking the doorway. The window treatment is a blue and cream stripe side panel with valance. We particularly love the wicker rocking chair with the pom pom fringe. 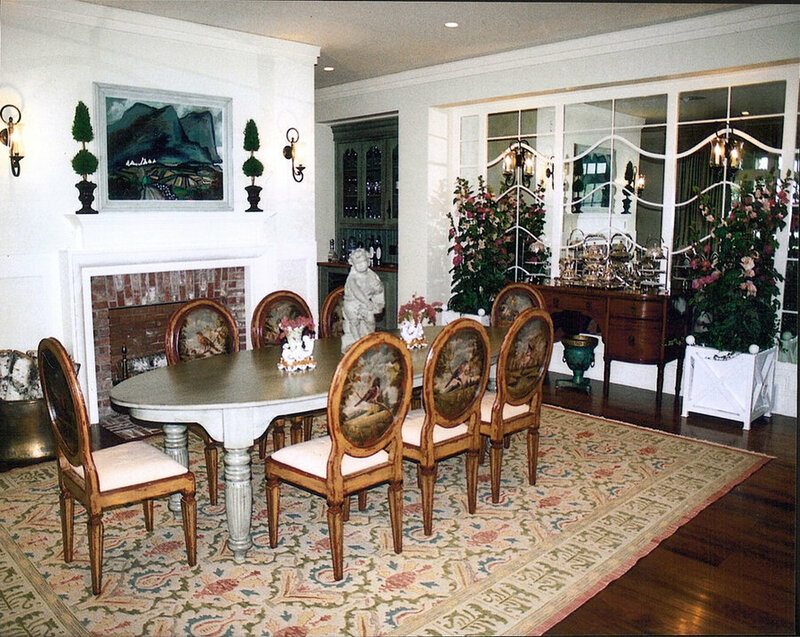 The chairs are all antiques, each with a handpainted bird and scene that can be found in New England. We chose to design the table with more of a nautical theme, so we chose more of an elipical "ship" shape. The antique birdcage was placed in the window. 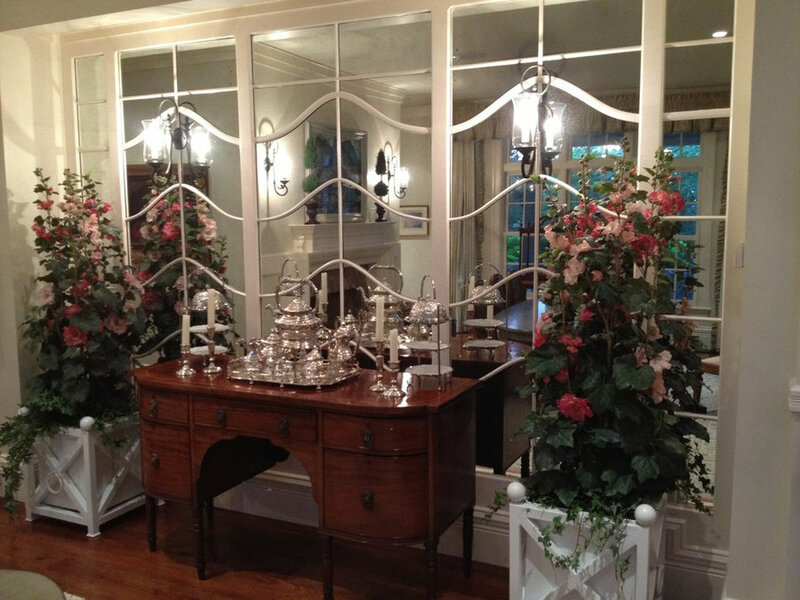 We created a mirrored wall at one end of the dining room with costume designed millwork remenicent of the Breakers Hotel in Palm Beach. For those romantic dinners we also duplicated the same design we created for the fireplace in the living room to give it balance. 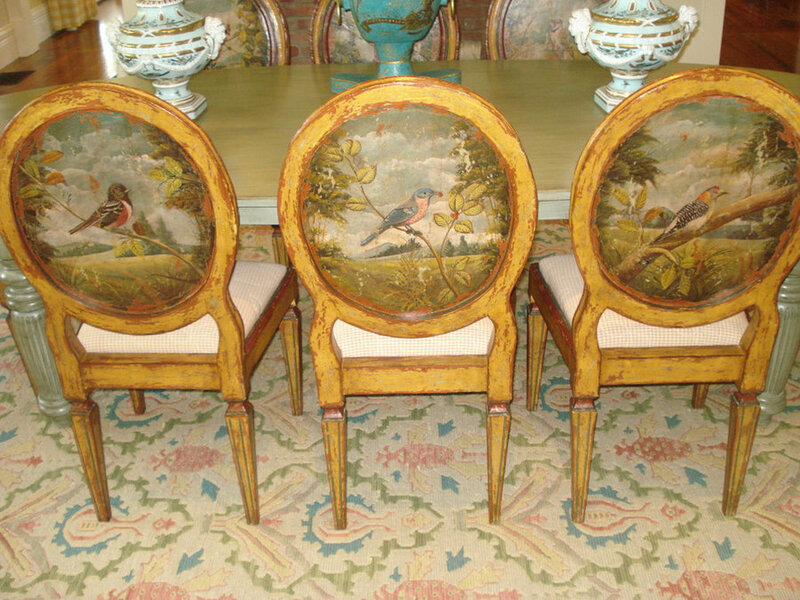 The chairs are all antiques, each with a handpainted bird and scene that can be found in New England. 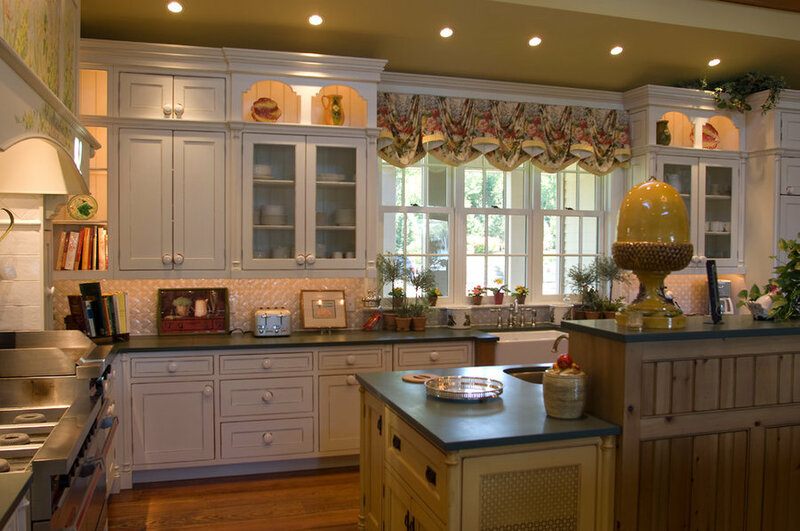 We designed this kitchen to be very functional, but also to have character with state of the art appliances. The island is comprised of three distinct peices of furniture, a butcherblock island, a slate storage bar top and a wood cabinet warming drawer. The countertops are slate on white cabinetry with the pale yellow walls. We designed this kitchen to be very functional, but also to have character with state of the art appliances. The island is comprised of three distinct peices of furniture, a butcherblock island, a slate storage bar top and a wood cabinet warming drawer. 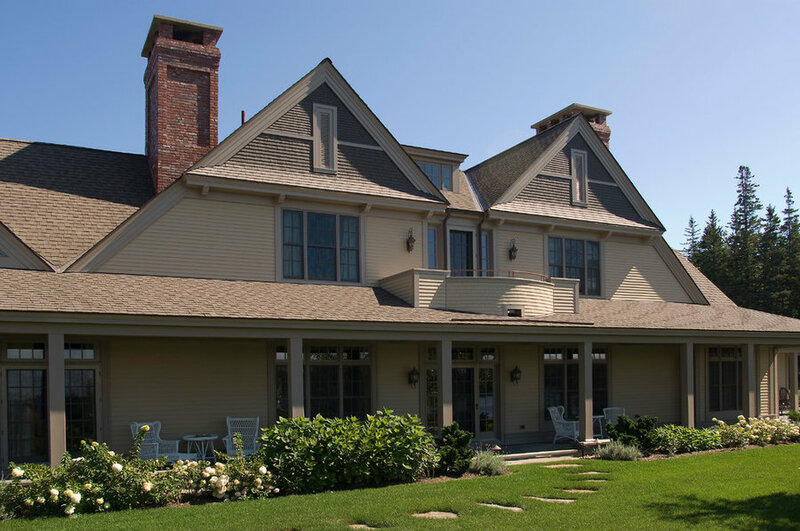 The ktichen is light and bright as we introduced dormers in the valued beamed ceiling. 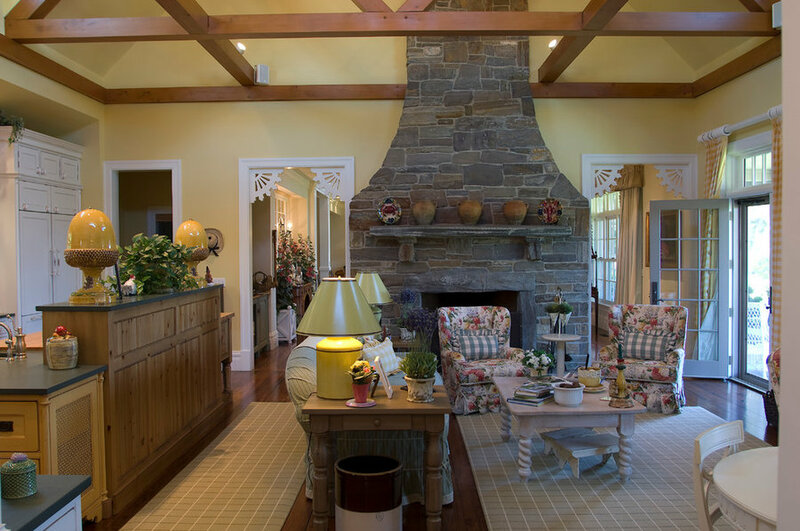 The hood over the commercial stove was painted by a local artist - Lynn Donovan. 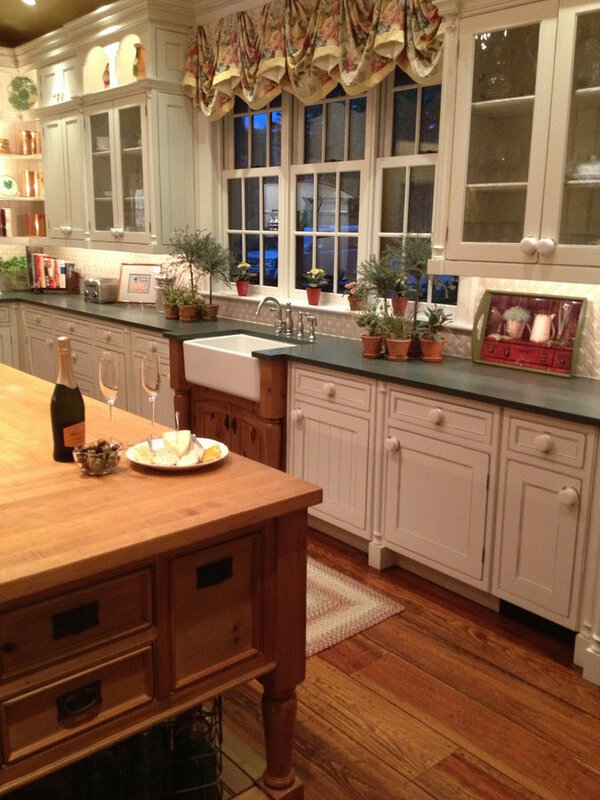 The countertops are slate. We designed this kitchen to be very functional, but also to have character. 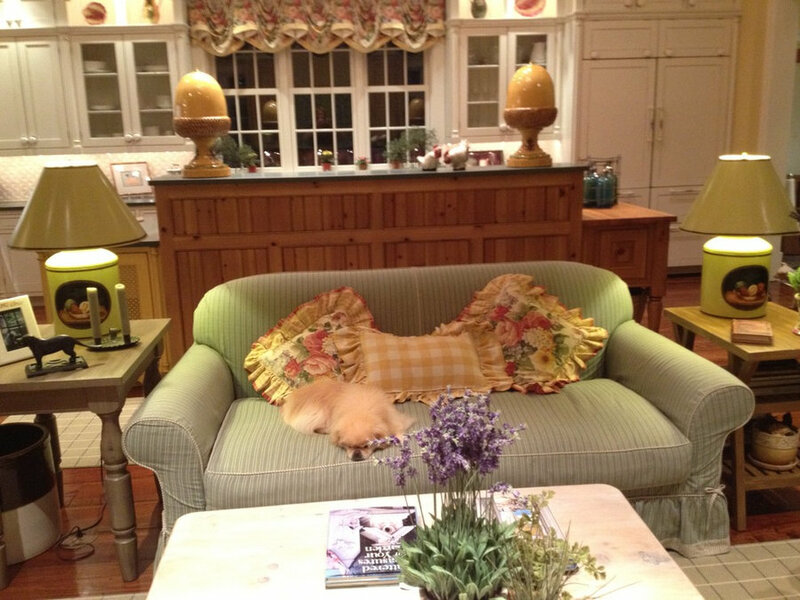 All of the furniture are slipcovered for their dog, . Flanking the sofa are a pair of distressed casual tables fauxed, with a pair of tole lamps custom colored. We kept the room bight by selecting the white cabinetry, and the pale yellow walls. We designed this kitchen/ great room in Maine to be very functional, but also to have character . As we created an open plan, the family room is right off it. We chose the shape of the laid stone fireplace for its fluidity in shape. 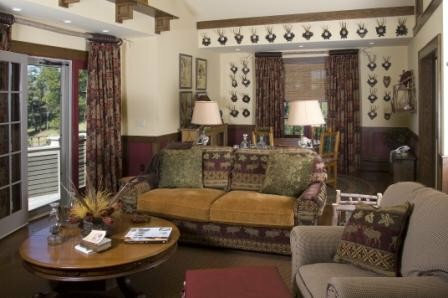 We also chose the floral swivel chairs so we can view the tv , the fireplace or people cooking in the kitchen. Flanking the sofa are a pair of distressed casual tables which we had fauxed, with a pair of tea caddy lamps custom colored. The drapery are oversized yellow and whtie plaid drapery. 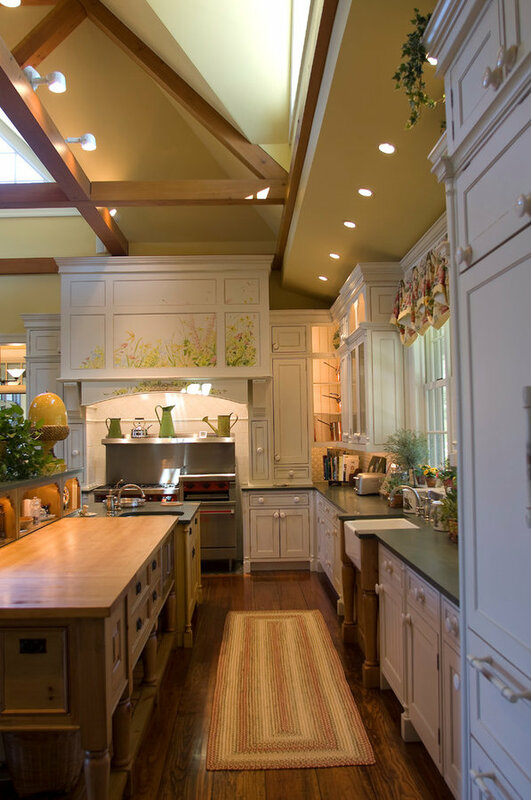 We designed this kitchen/great roomThe ktichen is light and bright as we introduced dormers in the valued beamed ceiling. As we created an open plan, the family room is right off it. We chose the shape of the laid stone fireplace for its fluidity in shape. We also chose the floral swivel chairs so we can view the tv , the fireplace or people cooking in the kitchen. The library has faux walls and millwork to look like they were ancient. Our artist Lynn Donovan completed the work. We chose to use oversized swivel chairs so you can view the fireplace, tv or the view. 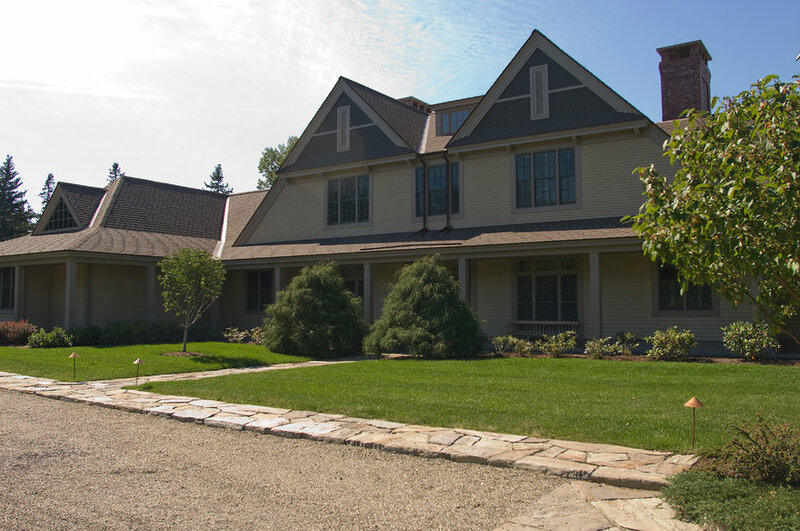 The library was designed as a room where the family can gather together around a fire and also watch a movie. We created areas were different activites can take place. 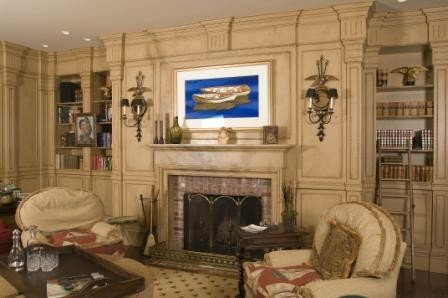 We chose to faux the walls and millwork to look like they were ancient. We chose to use oversized swivel chairs so you can view the fireplace, tv or the view. The ottoman with bullion fringe is comprised of 4 peices so when those unexpected guests drop by you can use this for addional seating. The draperies are indian tapestries in burgundy and gold. The pair of lamps are actually antique rum and whiskey jars which we electrified. Enjoy! 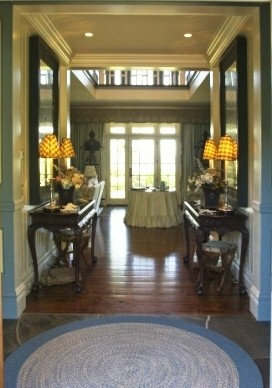 We combined new and antique peices to create the drama and warm feel this room creates. 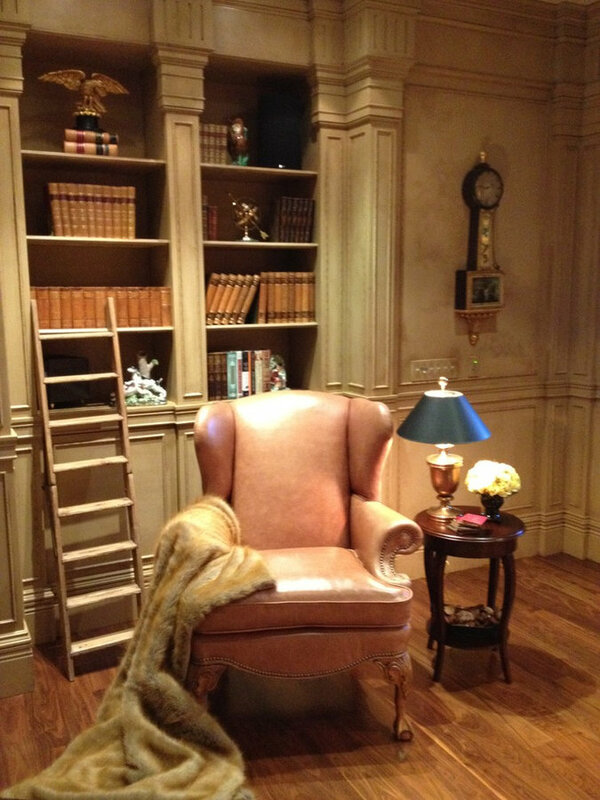 The Leather chair provides a place where you can cozy up to a good book. Enjoy! We designed this library from scratch. 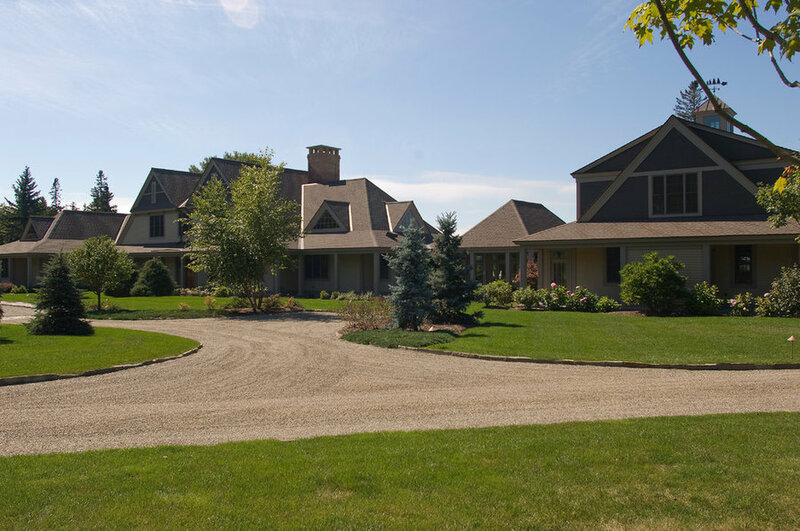 From selecting the flooring and designing the millwork to the books in the bookcases. We chose to faux the walls and millwork to look like they were ancient. 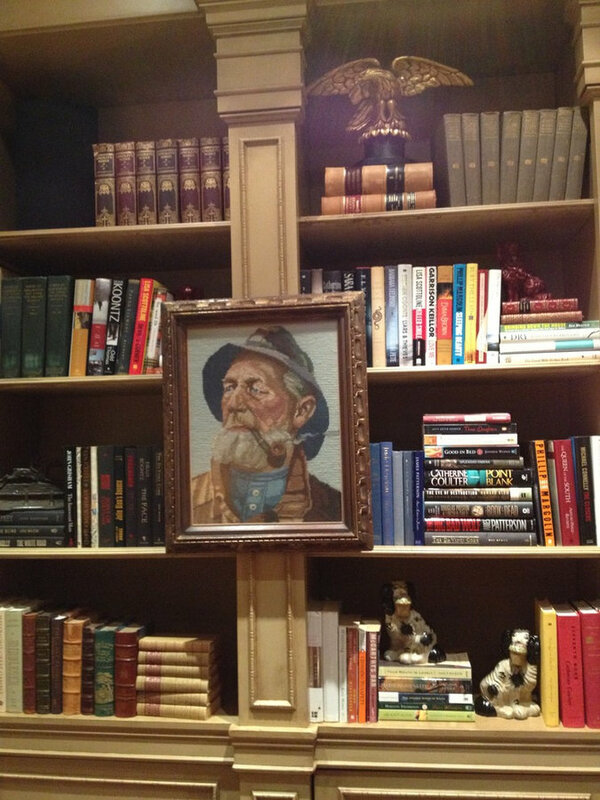 To create layers we chose to hung a antique needlepoint sea captian in an unexpected place between the bookshelves. Enjoy! 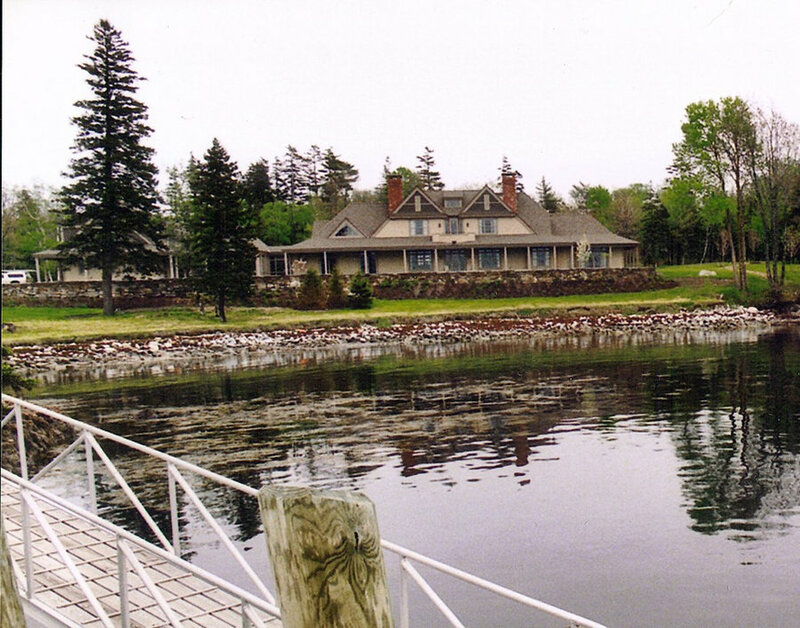 Since the home is located in Owlshead Maine, we chose to create the compass using features found in Maine like the moose, lighthouse, and sailboat to mention a few. In the center we chose to place "The Owl". The headboard was a screen which we have decided to mount on the wall. 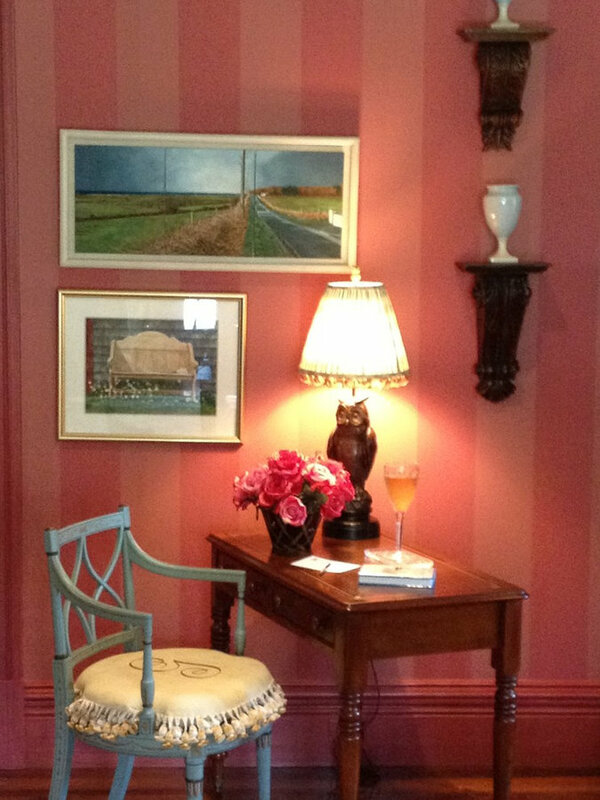 We chose to paper the room using a striped burgundy wallpaper. The drapeies are a large scale floral print fabric in rose, burgundy, pink and cream. At the foot of the bed we placed a curved arm loveseat in a small floral print with a cream background and ruffled skirt. We designed this masterbedroom for our client and friend using the headboard as the inspiration. The headboard was actually a screen which we have decided to mount on the wall and create an interesting headboard. As we were creating a cottagey feel for this room as part of the home, we chose to mix in various size floral prints on the sofa, duvet cover and drapery. We chose to paper the room using a striped burgundty wallpaper. As we were creating a cottagey feel for this room as part of the home, we chose to mix in various size floral prints on the sofa, duvet cover and drapery. 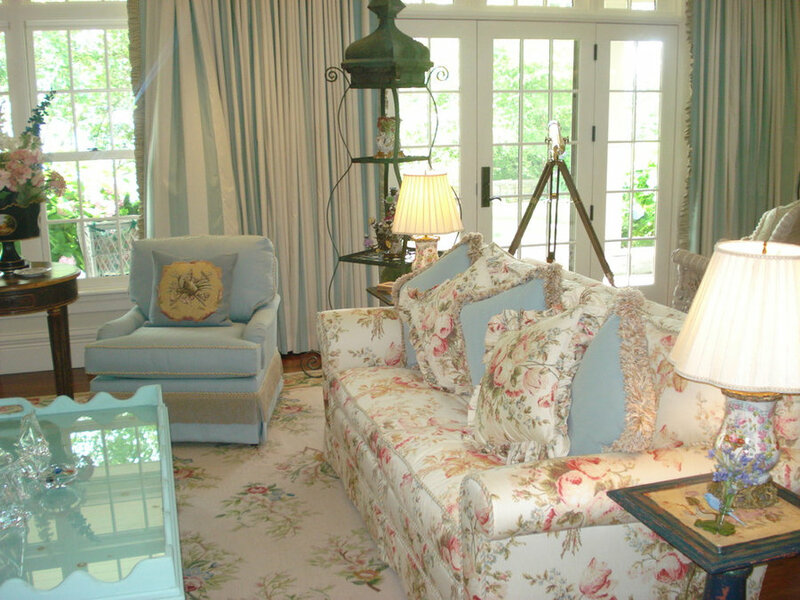 At the foot of the bed we placed a curved arm loveseat in a small floral print with a cream background and ruffled skirt. As part of the conversation area, we introduced a pair of rocking chairs all resting on a custom needpoint rug. Our pop of color is the pale teal blue which is on the accent pillows and which you see on the comfy side chair overlooking the bay. Enjoy! We like to furnish a room so that it has more than one function so we placed a desk. We selected the painted chair for its color and form. On the desk we found this antique owl lamp with a custom lampshade with feather fringe at its base. On either side of the tub, we chose to mimic the lines of the cabinetry and installed distressed antique mirror to reflect the light coming from the window. 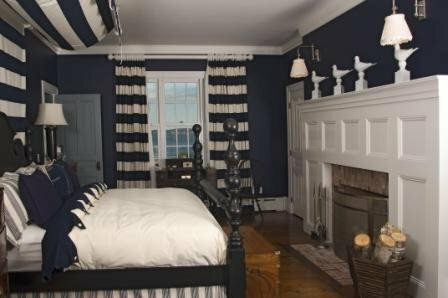 We painted the bedroom a deep Navy Blue! 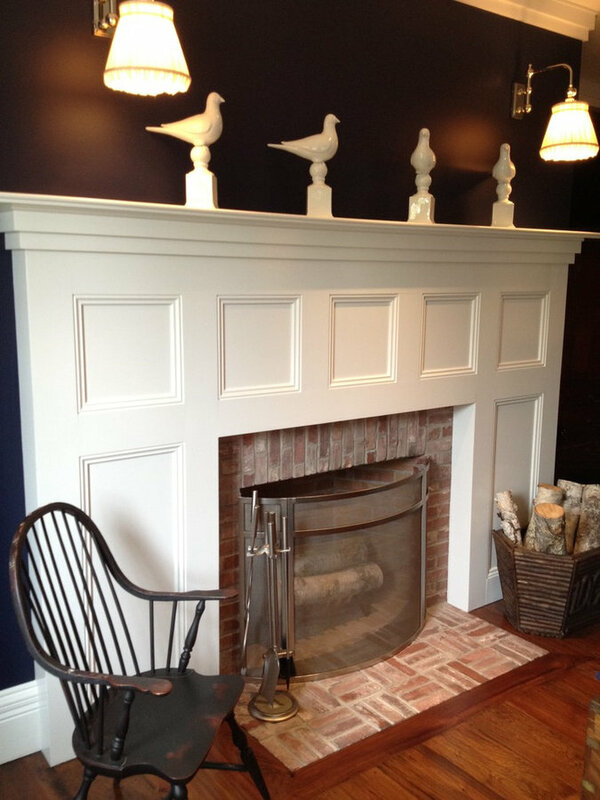 The fireplace mantel was designed so it was a statement piece. The side panels were in the navy and white horizontal. 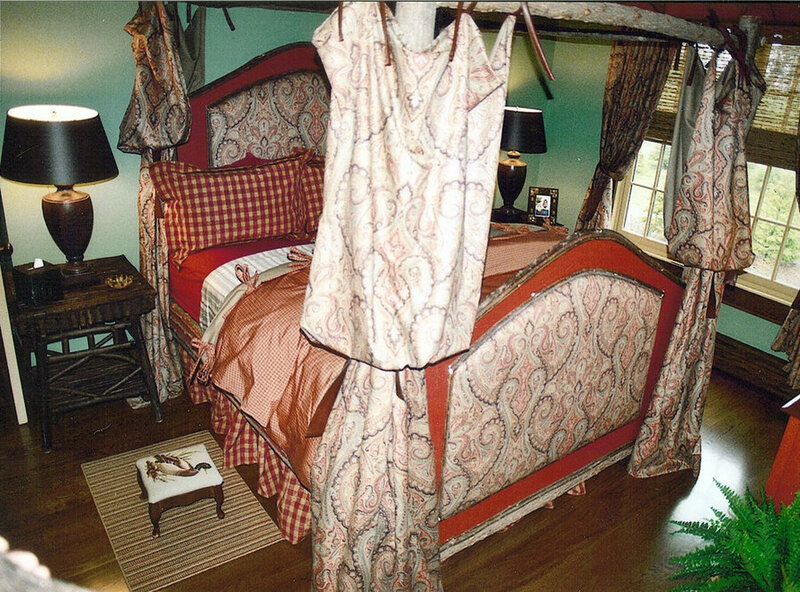 The same fabric for the overhead canopy over the bed. The duvet covet has a overlap with a zigzag pattern which is buttoned. We chose to design this fireplace much higher than normal. While this fireplace has 6 fireplaces, we wanted each to be different. 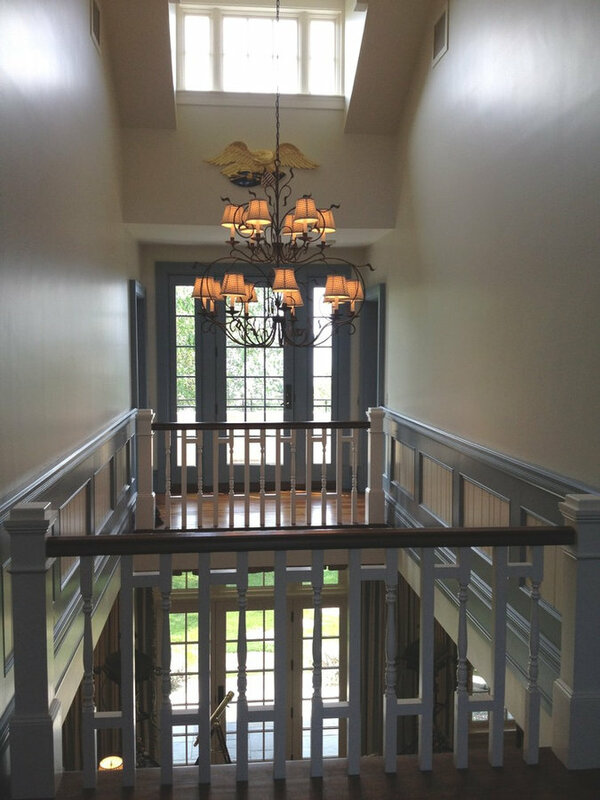 Rather than install typical sconces, we chose to install overarm swing arms wall mounted fixtures. This area provides a nice sitting area. 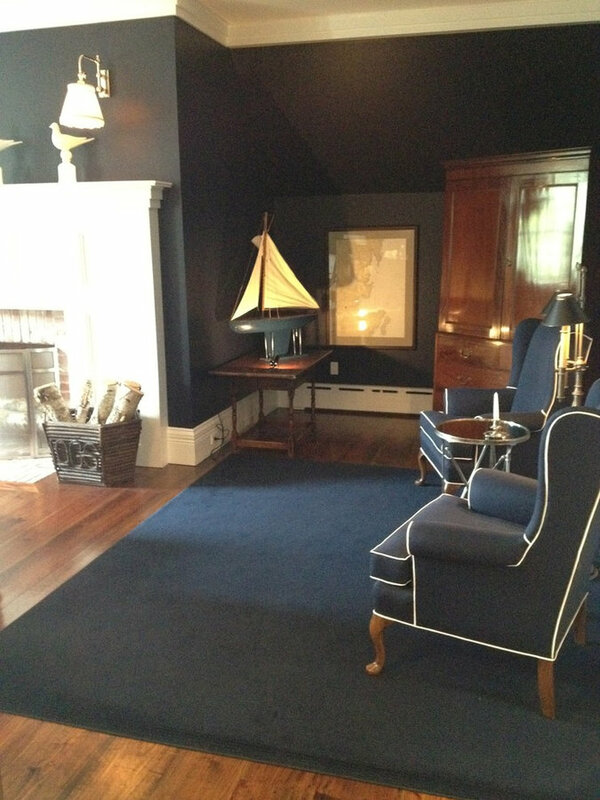 The pair of wing chairs are wrapped in navy and then piped in white. We also chose to display a boat from a childhood memory in this room. Enjoy! The vanity was designed using teak wook and is reminiscent of a workbench. 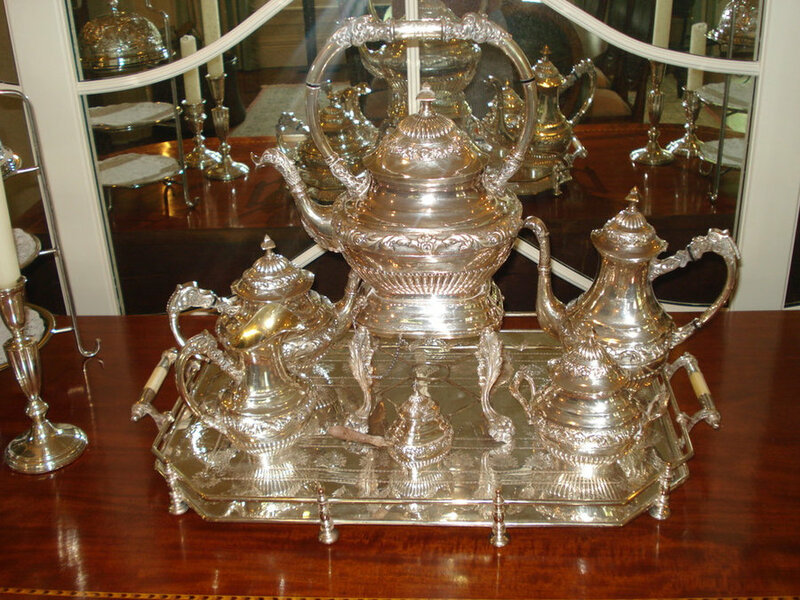 We electried antique serving covers which were cut in half. 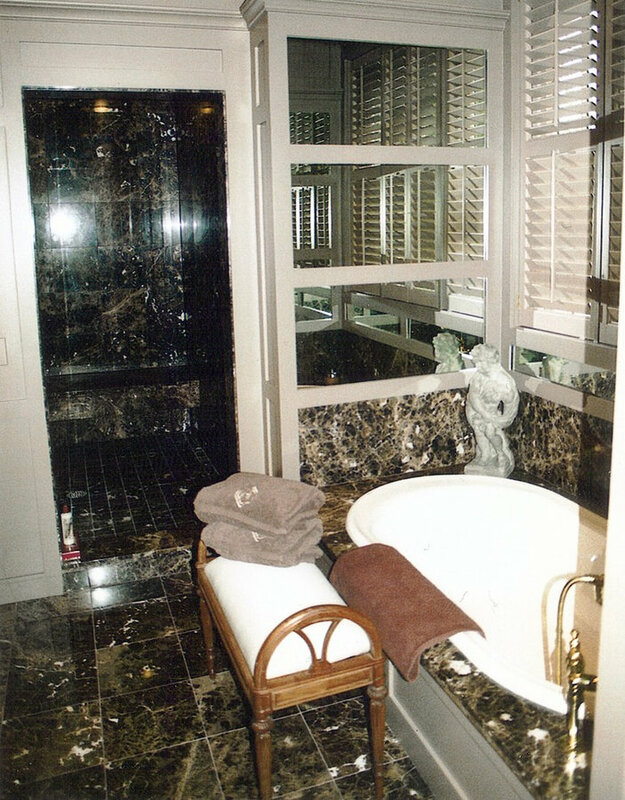 We created a coffered ceiling in this bathroom. 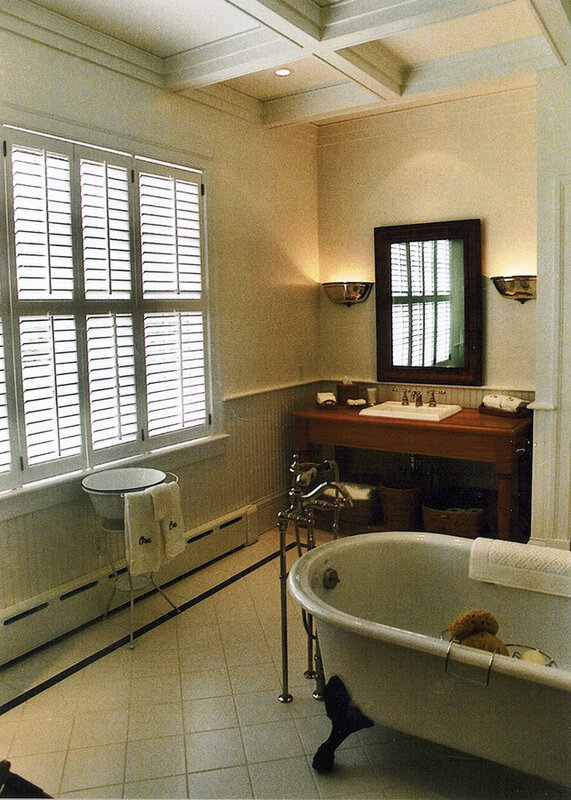 We designed this bathroom to be clean and contemporary with a nod to the traditional influence of the house. The antique metal grill work was from an old arched window and we chose to hang it like art work over the claw foot tub. 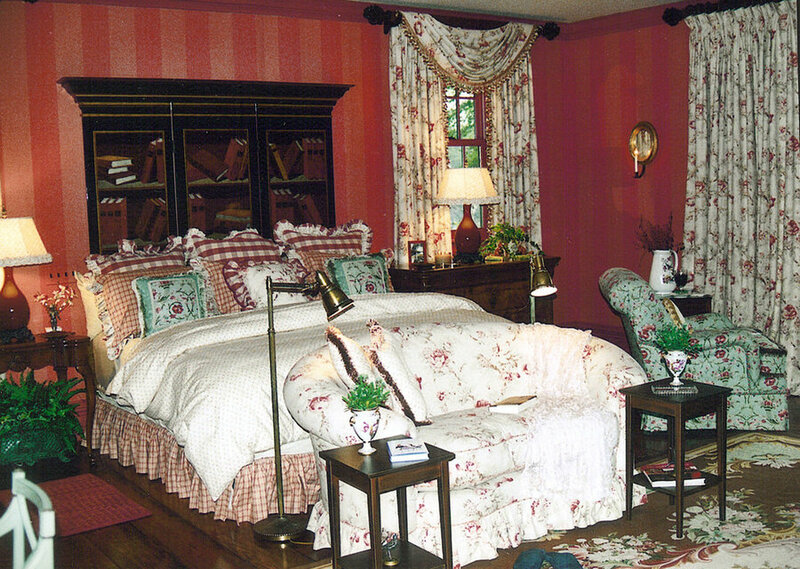 We designed this white birch canopy bed and fitted it with custom made Ralph Lauren bedding in a floral motif. Vintage lace and used it as an overlay on the flap. 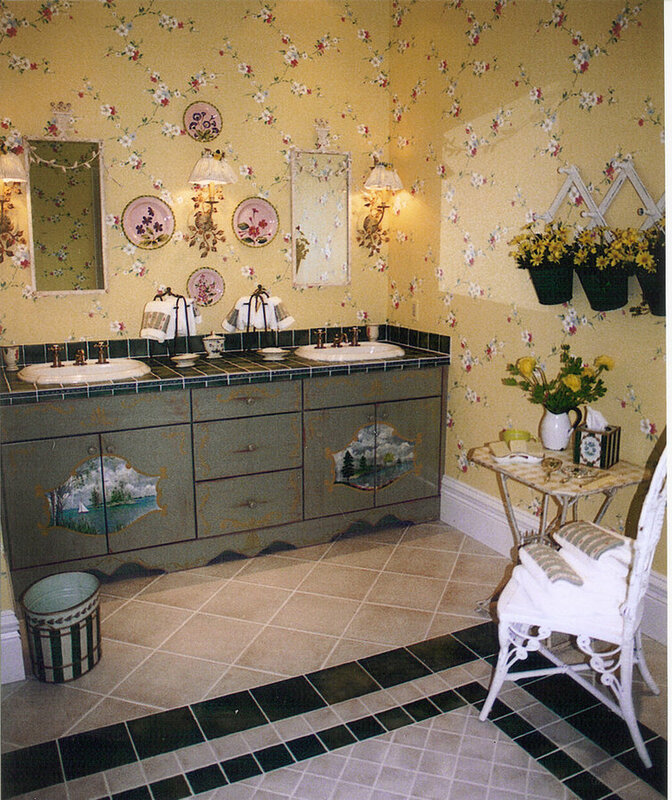 The room was papered using a tone on tone stripe wall paper in yellow. We hand painted a design on the top of the table to add some personality. You can use anything as a collection to create interest. 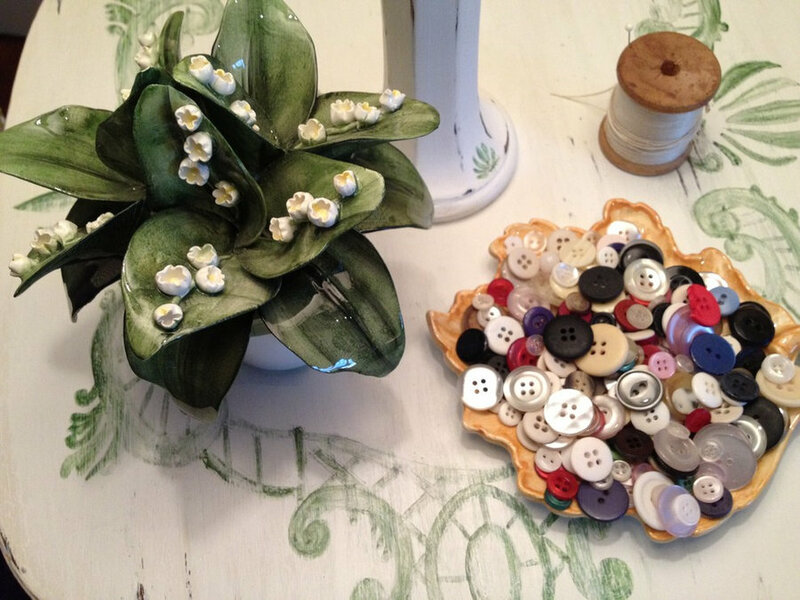 Here we added a bowl of buttons and a spool of thread. The bathroom for this suite was created by using an antique chest which we fauxed with scenes of the landscapes around Maine. The countertop is handmade tile. 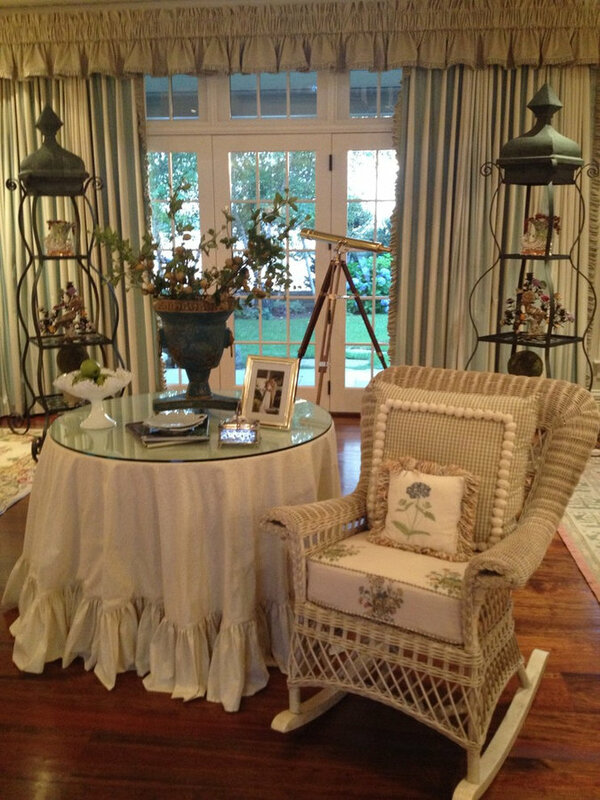 We placed an outdoor Victorian wicker chair and table, where one can sit while getting dressed. 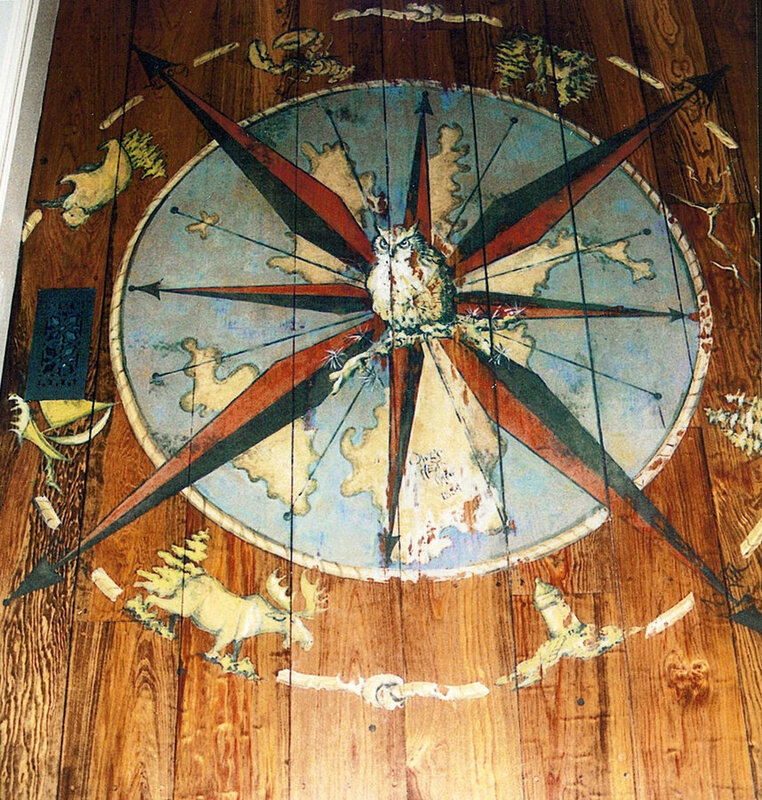 An inlaid floor design, adds another detail to an otherwise boring floor. 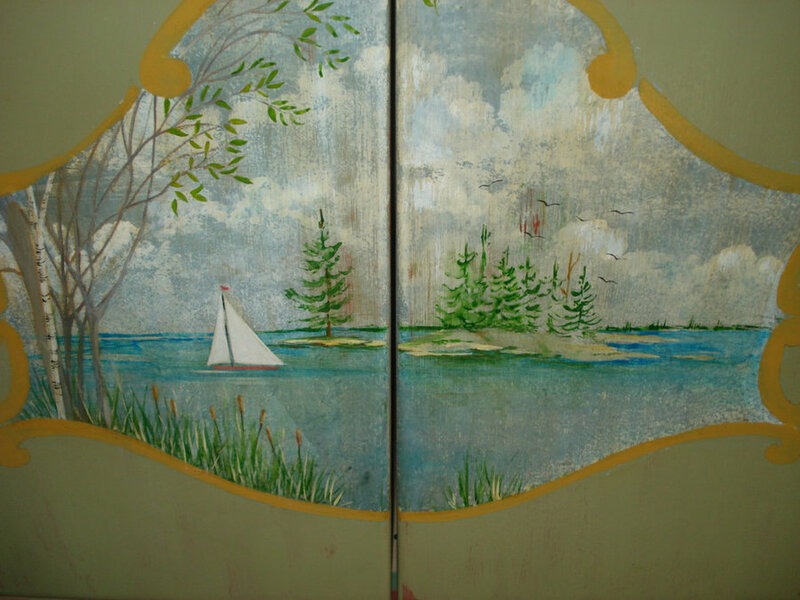 Here is a close up of the hand painted chest painted by Linda Sowa our favorite artist. 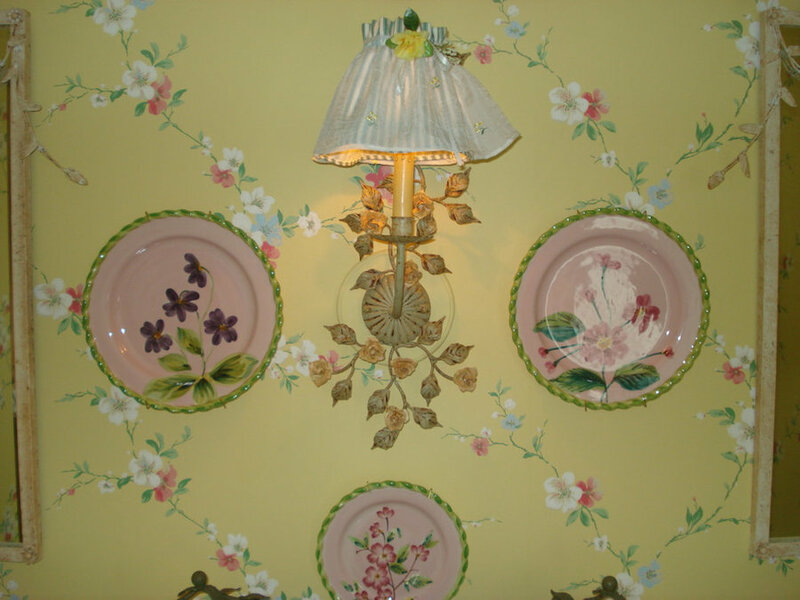 We placed these hand painted plates from a local artisian in Maine to surround the vintage metal floral sconce. 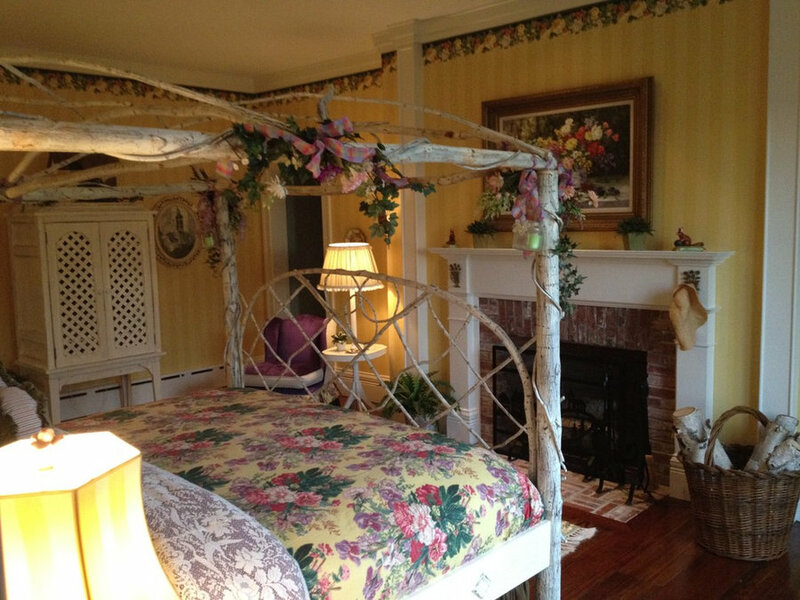 All of this rests on the lattice floral wallpaper. The Tea House is entirely surrounded by windows. 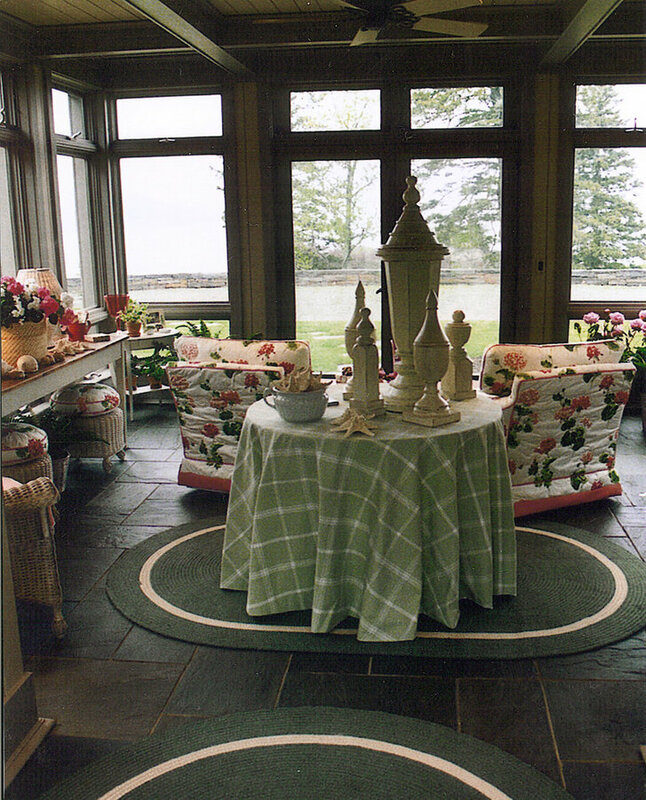 We placed a skirted the table in a green and white plaid fabric with some of the families collections and architectural elements. The color pallette of green, pink and white was used. We created an entrance hall table with some of the families collections and architectural elements from around the surround area which we purchased. 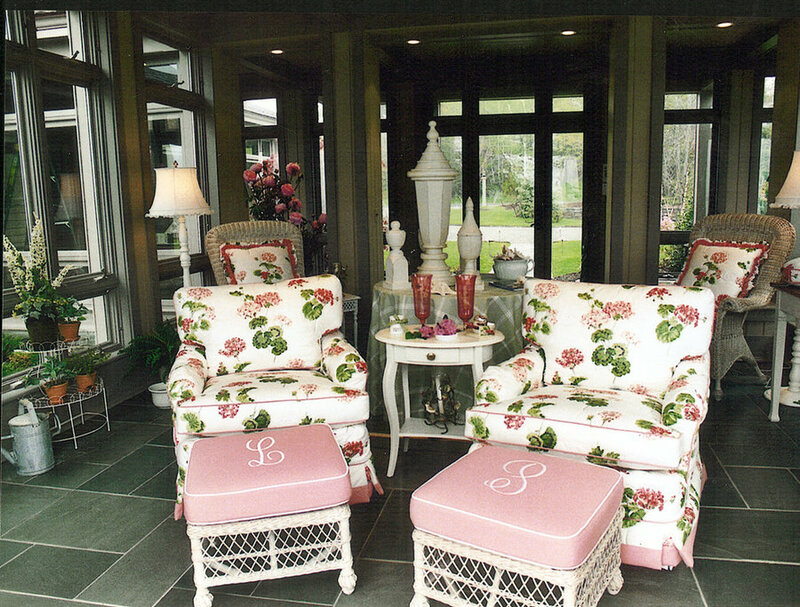 The swivel chairs in a geranium pattern fabric in pink and white. In front of them we place a pair of wicker ottomans with the parents initial. 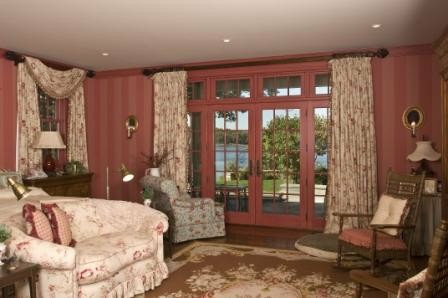 The accents of Cranberry Glass surround the room. 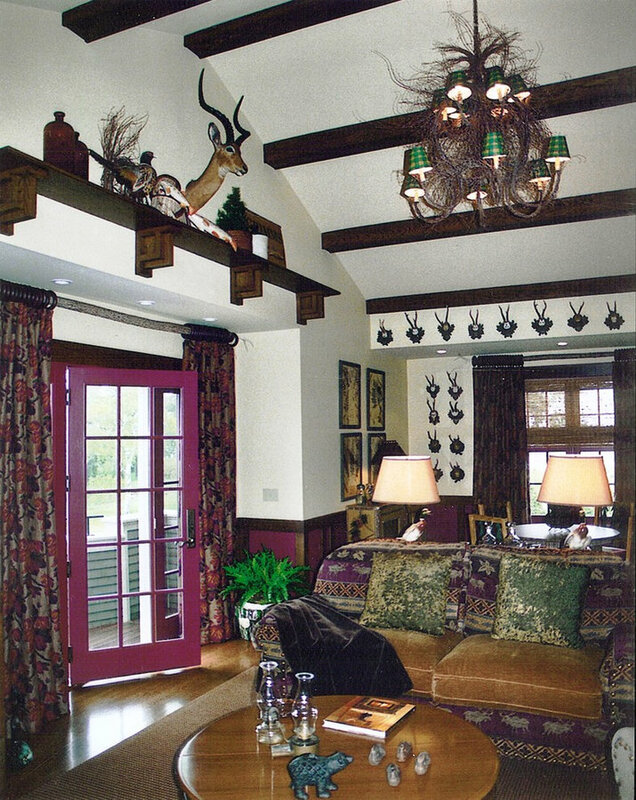 This two two story space is a guest quarters We chose to use burgundy's, forest greens and other earthtones to create this hunting lodge feel. The walls are surrounded by antique antleirs from Germany and Austria. The chandelier is made of branches. 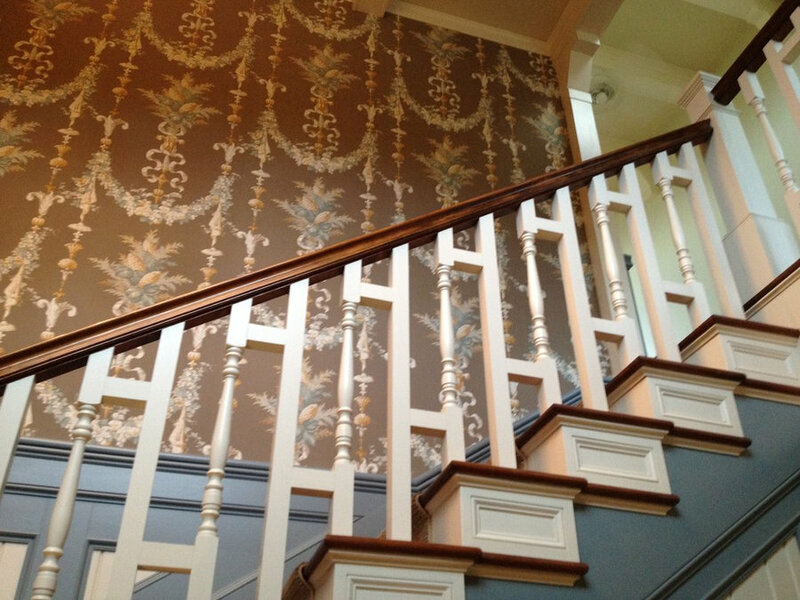 The draperies are maple leaf design on linen which are operable. Instead of using typicall drapery hardware, we chose to use a narrow tree. 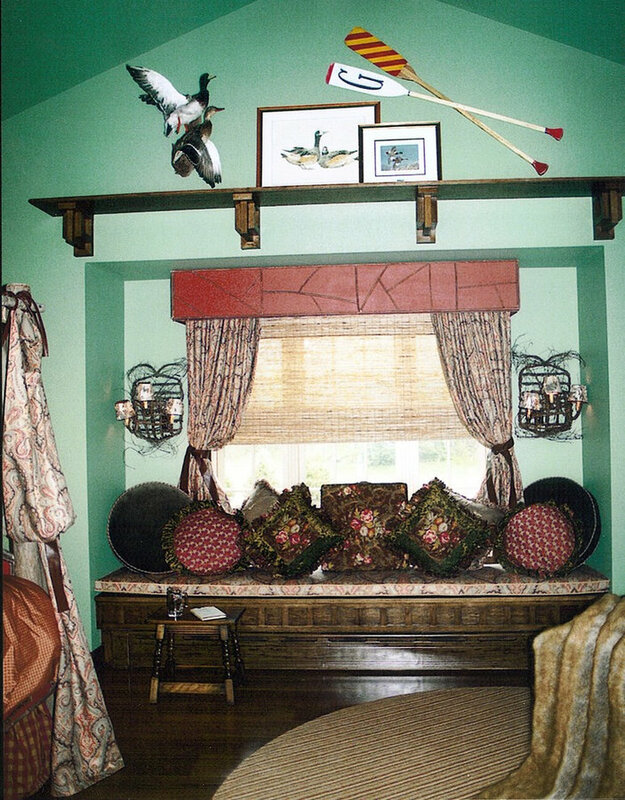 In the bedroom of the lodge, we created a custom window seat complete. As the ceiling was cathedraled, we chose to add a shelf to create a focal point to display some of our clients accessories. Thebedroom has a custom 4 poster bed, which we painted in a burgundy rust color made of tree trunks, which was then upholstered. 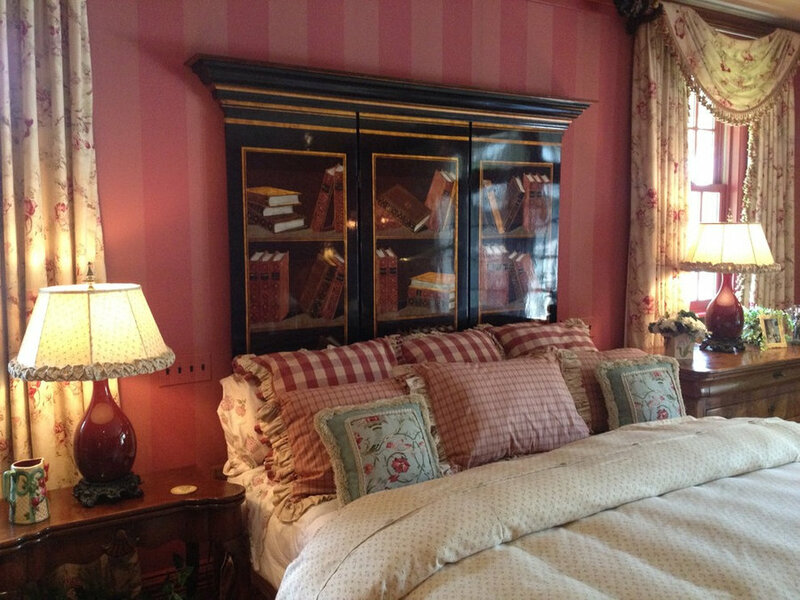 Several Ralph Lauren fabrics were used for the custom bedding, drapery and head and foot boards. 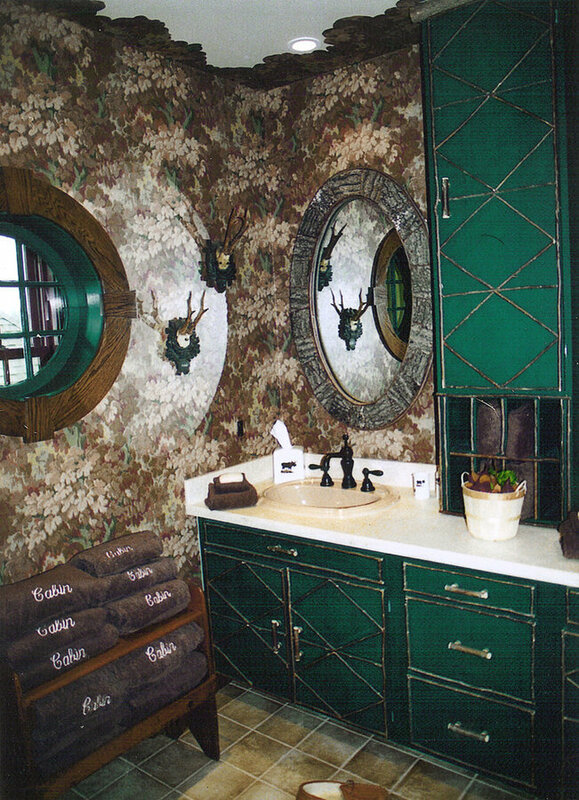 In this bathroom, we made custom cabinetry with branch trim and knobs. The mirror overhead was made using pieces fo twig branches. The room is papered using a wallpaper in leaves.